Day three ended with Northants on 522 for four in their first innings, which is in reply to Glamorgan’s 570 for eight declared. 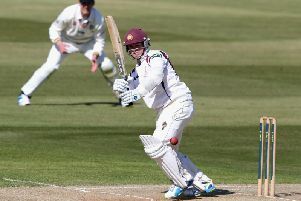 Rob Newton completed his century before being dismissed for 105, having taken part in a huge opening stand of 303 with Richard Vasconcelos, who went on to complete a career-best 184. 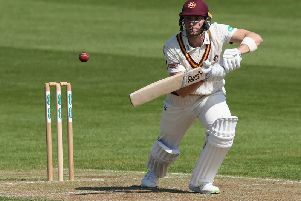 There were also half-centuries for Josh Cobb and Rob Keogh, who ended day three unbeaten on 73, and barring some wheeling and dealing between the captains ahead of day four, this match is going to end in a share of the spoils. In all, there have already been five centuries and 1,092 runs scored for the loss of only eight wickets on this bland pitch. While the batsmen have thrived and filled their boots with some early season runs, the bowlers will surely feel there should be more balance between bat and ball. The visitors started the day on 234 without loss with Vasconcelos and Newton taking their record- breaking opening partnership against Glamorgan to 303 before Newton was caught behind. Alex Wakely joined the left handed opener, but he departed soon after lunch, wafting at one from Graham Wagg to give Cooke his second catch. Vasconcelos had been at the crease for six hours 44 minutes facing 317 balls, hitting a six and 22 fours before he was lbw playing half forward to Labuschagne’s leg spin. It was a career best innings for the South African, surpassing the 140 he scored against Middlesex last year. He did, however, offer four chances during his innings, the first when he was dropped at slip on 21 off Marchant De Lange, and the last when two Glamorgan fielders almost collided going for the catch at long off. Cobb alternated between attack and watchful defence, striking a breezy 60 before he attempted to hit Billy Root’s off spin over mid- wicket, but instead sliced to cover point, to give Root his first wicket for his new county. Keogh then reached a sketchy half century and was joined by Adam Rossington. Glamorgan used their ninth bowler when Kiran Carlson was summoned to bowl his gentle off breaks, but the Northants fifth wicket pair took no liberties as they passed 500.